Other challenges included the Ice Cube Ski Jump on February 12, where fans are asked to film a video of creatively launching and ice cube into a cup of Coke. 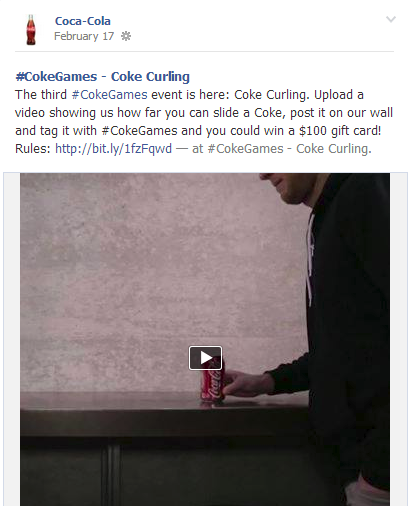 On February 17, the challenge was Coke Curling, where fans can shoot a video showing how far they can slide a Coke. The fourth and final challenge, Bottle Cap Hockey, launches today, February 20th (so make sure to enter!). This contest is strategic for Coca-Cola as a way to further maximize their official sponsorship of the Olympic Games in a way that is engaging and accessible to its passionate social media fanbase. The Olympics are held over a few weeks, so it’s important to continually mix in different types content with larger calls to action. It is also clever to focus the video contest around everyday Olympic inspired activities. Not everyone may have the potential to become an Olympian, but the small moments of greatness translate into a nice visual story through the videos. Video Contests pose a higher barrier to entry than asking someone to answer a question or submit a photo. Even with smartphones making it easier to capture and share video, it is still will turn away some users from entering. Instead, focus on the quality of entries and engagement on the video content – both company and user-generated – versus quantity as a KPIs. Coke was smart to allow entries across Facebook and Instagram for this promotion. Running a contest across several platforms allows you to tap into multiple audiences, thus encouraging more entries. For video, the sharing across Facebook and Instagram is seamless. Other platforms like Twitter, Vine and YouTube could have also been considered, but with video length limits, could have posed a complication in judging. Definitely make sure to weigh the pros and cons, plus fairness element to make sure everyone is on a level playing field. When developing your video contest, try to develop a theme that will generate video content that is re-usable on your social media channels during and potentially beyond the promotion. It’s great for the winners, but also for fans who may like the contest idea, but don’t have the interest or ability to enter themselves. With photo or video contests, it’s smart to be as communicative as possible in order to show your audience what types of entries you’re looking for. The best way to do this is by ceding the call for entries with company generated examples. Coke did a great job with this through the 10-15 second videos created to promote the contest across Facebook and Instagram. They’re all simple, fun and showcase the creative spirit of the campaign. With a higher barrier to entry in producing video content, consider upping your prizing and extending the time window of the contest. Fans know that they will have to spend more time on the entry, so a chance to win a better prize could help encourage higher quality entries. Plus, a few days or a promotion that wraps around a weekend can offer busy fans a chance to enter. Just make sure to pulse in a few additional posts or tweets to remind people to enter during a longer time window. Looking for other examples of successful video contests on social media? 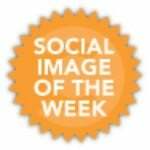 Check out these past Social Image of the week columns from General Electric and Pringles/Star Wars!